We at BBQ Smokehouse specialize in authentic Midwestern Style Kansas City Barbecue and Louisiana Creole Cuisine side dishes. 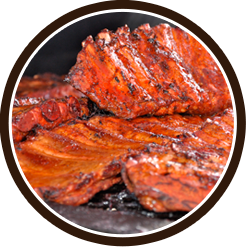 Our Choice Cut Meat Selections are carefully prepared, well seasoned, and slow smoked or grilled to perfection. We never cheat the preparation process by boiling or baking the meat, which robs away the flavor and natural juices of the meat. Whether it’s a birthday party, family reunion or wedding make any event delicious with our smoked ribs & steaks. A crowd pleasing favorite, our mouth-watering BBQ chicken is juicy, tasty & grilled to perfection! 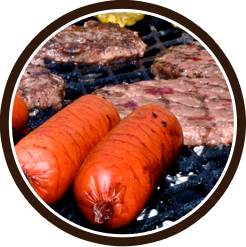 Never boiled, baked or steamed, our burgers & hotdogs are grilled fresh on location & served hot off the grill! Need Catering For Your Next Event? 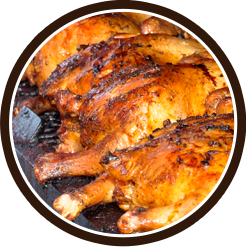 Our delicious Southern & Creole BBQ Cuisine is Perfect for any occasion! 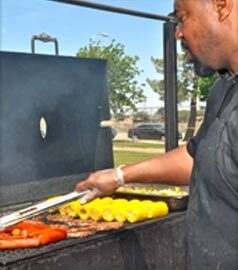 Our Grill Master will cook up well seasoned slabs of ribs, Tri-Tip, Steaks, Chicken, Burgers and Hot Dogs. The Pulled Pork is so juicy and tender, we call it cotton candy. Fun, casual, barbecue catering with delivery to your home, business or local park. We’ve got your BBQ needs covered for any event from a wedding, anniversary, birthday, family get together, Bar Mitzvah, Bat Mitzvah, quinceanera, or office party. No other caterer can beat our variety, prices, quality, and service. Family owned and operated full service BBQ catering company dedicated to making your event delicious. Our mission is to provide high quality southern and Creole BBQ food as well as service to all of our customers. Ready to order catering for your next event? Treat your guests to delicious, authentic southern and Creole BBQ! Call us today to schedule catering for your next party or event! Copyright © 2019 The BBQ Smokehouse. All Rights Reserved.